In this, Her Majesty’s official Diamond Jubilee portrait, Queen Elizabeth II is wearing a stately white gown made of silk, satin, and lace. Elegantly enhanced with silvery sequins in patterns across most of the bodice, including along the beautifully scalloped neckline, this beautiful dress was designed specifically for the Diamond Jubilee by Her Majesty's personal fashion adviser, Angela Kelly. Ms. Kelly is responsible for all the details of Her Majesty’s public fashion, including designing her clothes, choosing her accessories, and coordinating with dressmakers. For the photo shoot conducted by Mr. John Swannell, the Queen wears the favored George IV diadem, Queen Victoria’s Collet Necklace with matching earrings. She also wears the Royal Family Orders of her father and grandfather pinned to the blue Garter Riband on backdrops of fringed silk ribbons. The Garter Riband affirms her position as Sovereign of the Garter, head of the Most Noble Order of the Garter. This order reigns as the highest chivalric order (society of knights), which was founded in 1344 by King Edward III. In 1935, King George V, Her Majesty’s grandfather, presented her with his Royal Family Order. Established in 1911, this family heirloom features, framed in brilliant cut diamonds, a portrait of His Majesty King George V wearing his Admiral of the Fleet uniform. A miniature replica of the [Imperial State Crown] overlaying an enamelled cap of estate, suspended from a string of diamonds mounted in gold. The backside bears the date (1911) and George V's royal cypher set in diamonds. The badge is fastened by a platinum brooch pin to a riband bow in the pale blue associated with the Royal Guelphic Order of Hanover. Shortly before her coronation in 1937, Elizabeth II received from her father, King George VI in 1937, the Royal Family Order badge which bears his painted portrait surrounded by baguette and brilliant cut diamonds suspended beneath a stylized miniature of the Imperial State Crown. Its moire-silk ribbon is pale pink. 1. Debrett's. "Angela Kelly." Accessed June 4, 2012. http://www.debretts.com/the-queen's-diamond-jubilee/style-icon/clothes/angela-kelly.aspx. 2. The Official Website of The British Monarchy. 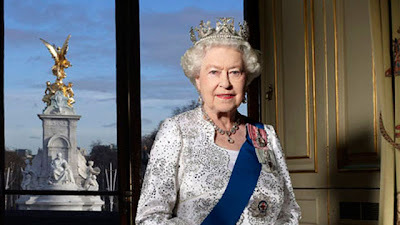 "Official Diamond Jubilee photographs released, 6 February 2012." Accessed June 4, 2012. http://www.royal.gov.uk/LatestNewsandDiary/Pressreleases/2012/OfficialDiamondJubileephotographsreleased6February.aspx. 3. Gracie Jewellery Blog. "Royal Family Orders." Posted April 26, 2011. Accessed June 4, 2012. http://graciejewellery.blogspot.com/2011/04/family-orders.html. 4. Royal Collection. Queen & Commonwealth: The Royal Tour. Photograph: "King George VI Royal Family Order." Accessed June 4, 2012. http://www.royalcollection.org.uk/microsites/queenandcommonwealth/MicroObject.asp?item=5&themeid=946&object=200167&row=5. 5. Royal Exhibitions. "King George IV Family Order." Accessed June 4, 2012. http://royalexhibitions.co.uk/royal-orders/george-iv-order/. 6. Royal Collection. Queen & Commonwealth: The Royal Tour. Photograph: "King George V Royal Family Order." Accessed June 4, 2012. http://www.royalcollection.org.uk/microsites/queenandcommonwealth/MicroObject.asp?item=4&themeid=946&object=200166&row=4&detail=magnify. Great description and meanings of the Queen's attire and jewels and emblems! So much to keep track of, but then she does have help I'm sure. Thanks, Gram. I often find myself grateful I don't have to keep track of all those things the Queen has to manage. What is really funny about your comments about Great-Grandma is that this morning I was looking at a photo of Queen Elizabeth II wearing the Imperial State Crown, and there was something so familiar about her...I thought of you, but that wasn't quite right. It must have been Great-Grandma. And I didn't know that she was part English. I thought she was full German. Cool!